Artichokes have always been to me, a beacon of spring. In the US, though available year-round on the west coast, most of the country starts seeing them in March; in the UK they typically debut in May. So living in the UK – for less than two more months :(( – I’m just now glimpsing the first artichokes of the season. Most people eat the hearts which are sold marinated in jars and often feature in salads, on pizzas and with antipasti platters. My local grocery store just started selling a grilled, olive-oil marinated artichoke heart in their prepared section which has become my new favorite picnic staple. (Yes, now that it’s finally sunny and warm here, I’m using any excuse to pack a blanket and head off to Richmond Green!). I do love my artichokes. But when I’m fixing artichokes at home, boiling them with a bit of lemon and salt is the way I roll. Everyone gets their own whole artichoke and dish of melted butter. These are too good to share. The artichokes are eaten in two steps: (1) leaves and then (2) heart. Step #1 – leaves: Pull off outer leaves one at a time. Dip the base of the leaf into the melted butter then pull through your teeth to remove the soft, pulpy portion of the leaf. Discard remaining leaf. Continue peeling off leaves until you get to the small, soft leaves in the center which don’t have much pulp on them. Discard these inedible leaves and then you’re left with one of the best parts of the artichoke, the fuzzy heart. Which brings us to….. Step #2 – the heart. Using a sharp knife, remove the fuzz covering the top of the heart. Cut the heart into a smaller pieces, dip them into the melted butter and eat. Now repeat this entire process as often as you can, until artichoke season has ended. Note: Recipes don’t get much easier than this. 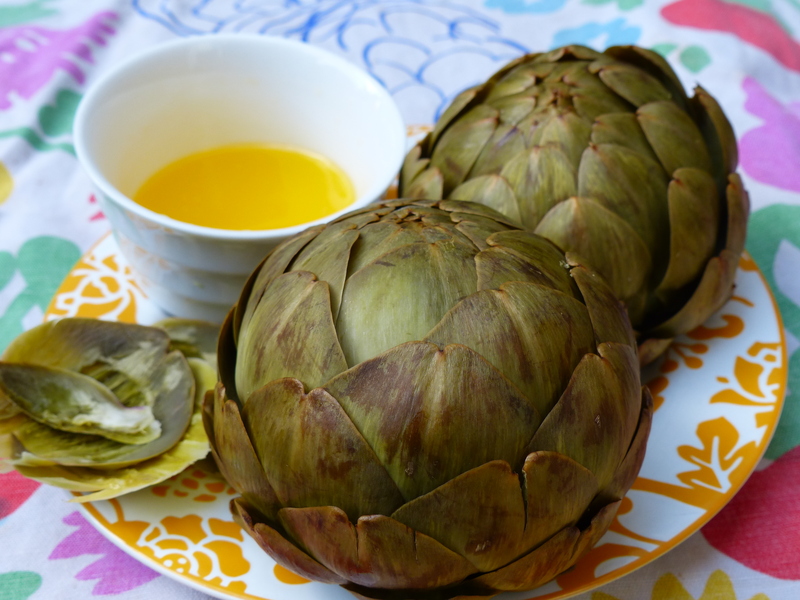 My only advise is this: although the artichokes take only about 20 minutes to cook at a simmer, it can take at least 20 minutes to get the water boiling, so plan on starting the artichokes about an hour before you intend to eat. 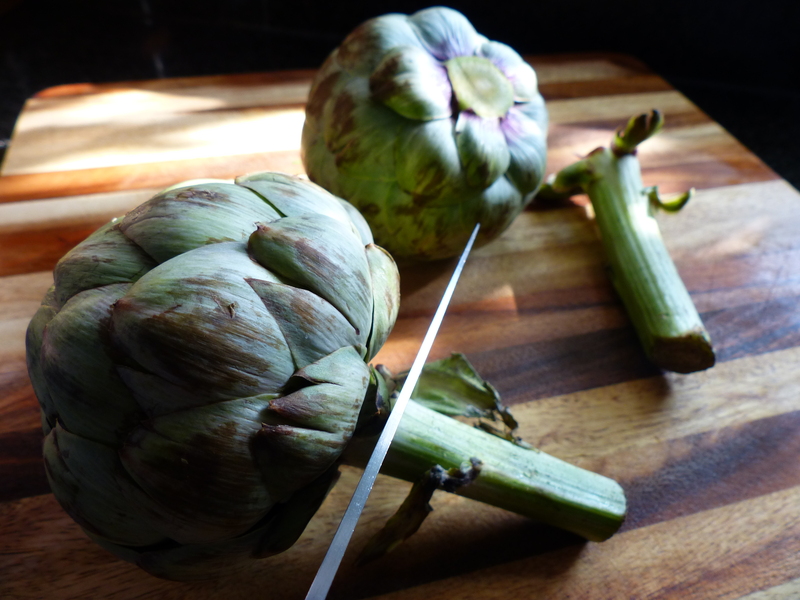 Cut off the artichoke stems as close to the base as possible. Discard the stems. 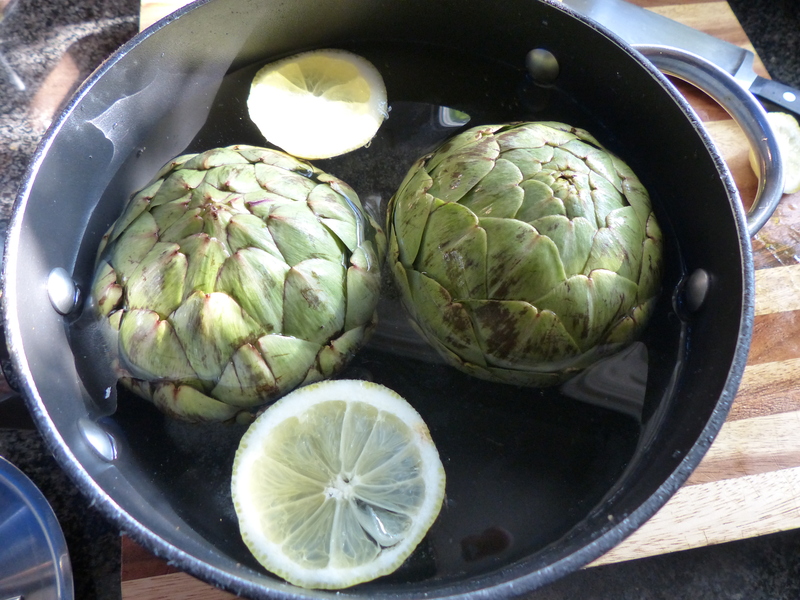 Place artichokes in a pot with a lid and fill the pot with water so that artichokes are completely covered by at least an inch of water (water will evaporate as artichokes cook and you want them to be completely underwater the entire cooking time). Add the lemon slices and salt. It’s best if artichokes fit snuggly, as this prevents them from bobbing up to the top. However if artichokes are bobbing (as mine did) place a heavy lid or plate above the artichokes to submerge them. 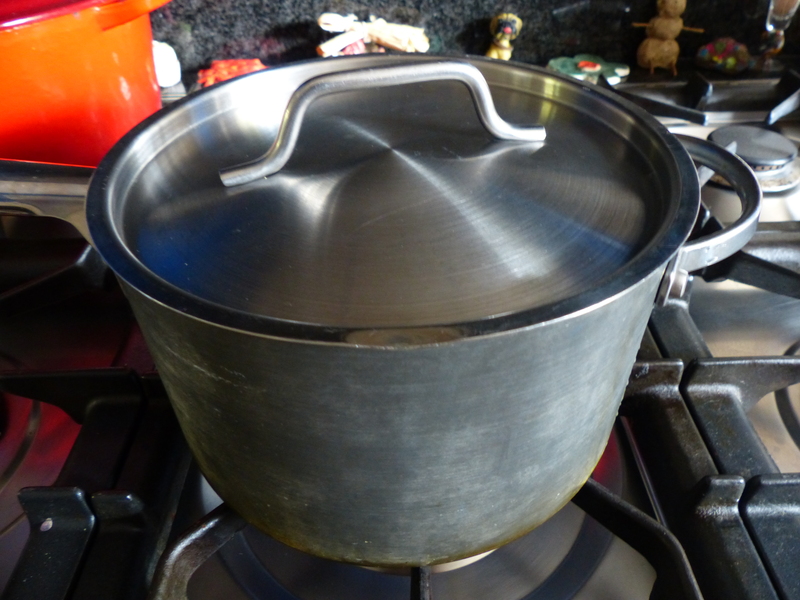 Place the lid snuggly on the pot and heat on high until boiling. Once boiling, reduce heat and simmer for about 20 minutes or until a sharp knife inserted into the base meets no resistance and the leaves pull off easily. Serve with melted butter for dipping. Salted butter is best, but if you only have unsalted, add a pinch of salt to the melted butter and/or a onto the cooked artichokes. 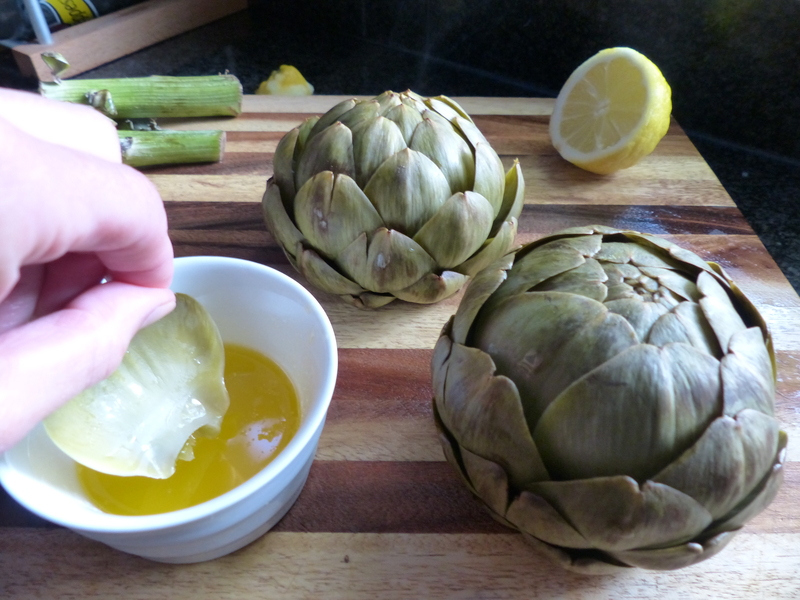 And if you’ve never eaten a whole artichoke before, here’s how: Pull off outer leaves one at a time. Dip the base of the leaf into the melted butter then pull through teeth to remove the soft, pulpy portion of the leaf. Discard remaining leaf. Continue peeling off leaves until you get to the small, soft leaves in the center which don’t have much pulp on them. Discard these inedible leaves and then you’re left with one of the best parts of the artichoke, the fuzzy heart. Using a sharp knife, remove the fuzz. Cut the heart into a smaller pieces, dip them into the melted butter and eat.